Institute of Electronics is recognised by DTE, Govt of Telangana. The programmes are sponsored by MHRD, Govt of India under NSQF Community College Scheme. The courses offered are Videography and Editing - Level III and Level IV. Duration of the course is 2 months. 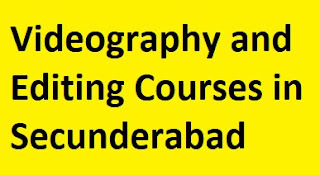 Candidates can submit the applications for the above mentioned courses at Principal, Govt Institute of Electronics, East Maredpally, Nehrunagar, Secunderabad. You can also collect the forms from the address mentioned above. Eligibility for Level III: Pass in SSC / ITI / IVC in relevant trande. Eligibility for Level IV: Pass in Level III OR pass in SSC / ITI / IVC in relevant trade along with minimum two years of work experience. The institute has informed that the course is offering 100 percent placements. Polytechnic dropouts / backlog candidates also can apply. Application forms can be obtained from 16 July 2018. Closing date for the receipt of applications is 28 July 2018. Eligibility Test for Level IV will be held on 31 July 2018. Class work will commence from 3 August 2018. For details, contact 99494 44921. Address: Institute of Electronics, East Nehru Nagar, Secunderabad.